When Spring finally arrives every year I don't get worked up about ramps or spring onions when they hit the market. I enjoy sunshine and magnolia blooms and dogwood trees and cherry blossoms just as much as the next gal, but the only thing I really get excited about every May is rhubarb. It is my very favorite vegetable disguised as fruit to cook with and it is so welcome after a long winter of apples and pears. We get plenty of delicious rhubarb in NYC, but I can never seem to find locally grown barb that is as vibrant in color as the stuff I used to find in the Northwest. I hear it is because those deep red plant starts are hard to find in the Northeast, but thanks to an online friend turned real-life friend I recently found myself with a glut of the most perfectly rosy red stalks of homegrown rhubarb. Camille to the rescue! With gorgeous rhubarb! Maybe I'll just have to keep my eye out for a deep red rhubarb start next time I am visiting my family to bring back with me. This year, to start off my rhubarb extravaganza (and there will be an extravaganza) I bring to you this wonderfully complex dessert that is surprisingly simple to put together. It is cool and tart, floral and herbal, creamy and sweet all in one. If I was Southern I might say, y'all gotta try this one. Instead I will say, seriously you guys, if you have an ice cream machine this should be the first thing you make with it this Spring. If you peek over at the sidebar you may notice something new and very exciting. 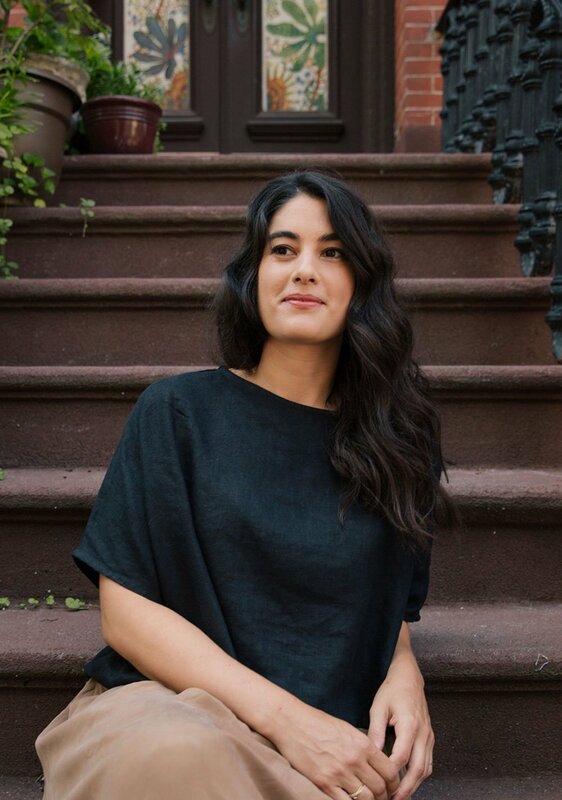 I am so happy to announce that this here blog was featured as one of Saveur's Sites We Love. You can check out the post here. Oh, and sorry for the extended break between my last post. I'll be back soon, with more rhubarb! 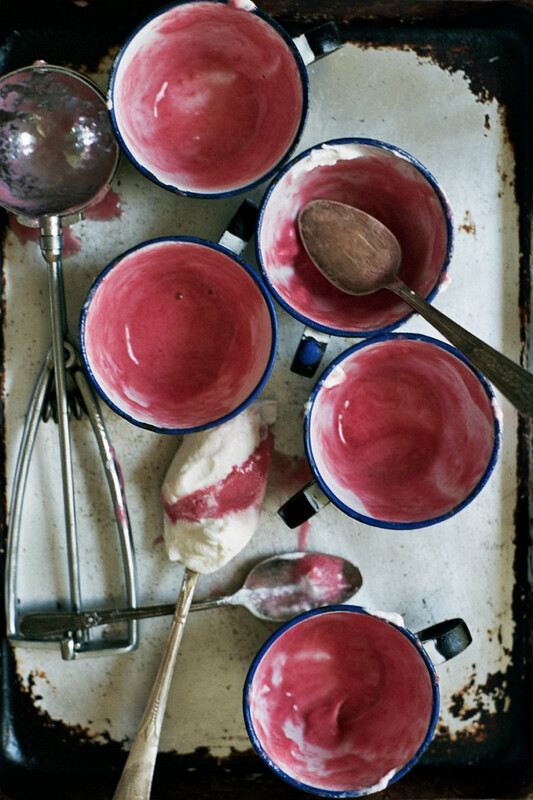 More rhubarb recipes from the archives of this blog can be found here. 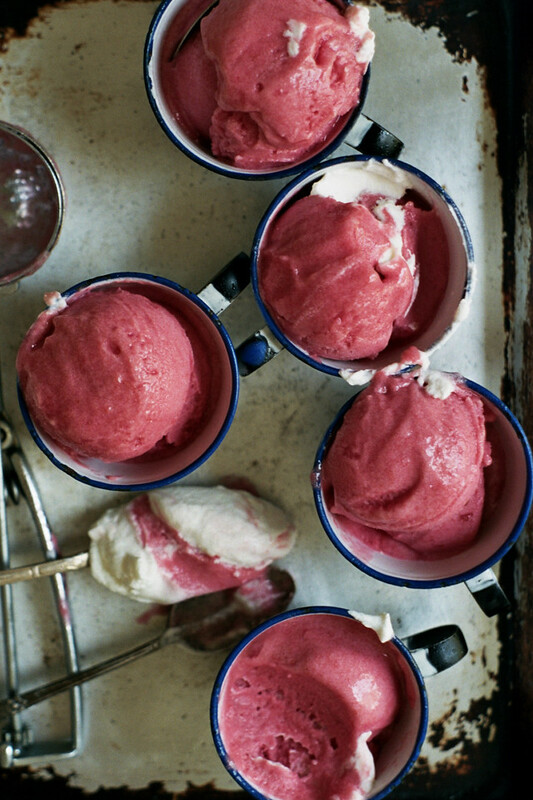 The herbal flavor of gin complements the sweet-tartness of this rhubarb sorbet wonderfully and the small amount of alcohol makes the frozen sorbet perfectly scoopable. If you don't like gin, feel free to substitute vodka or leave the booze out entirely for a more family-friendly treat. 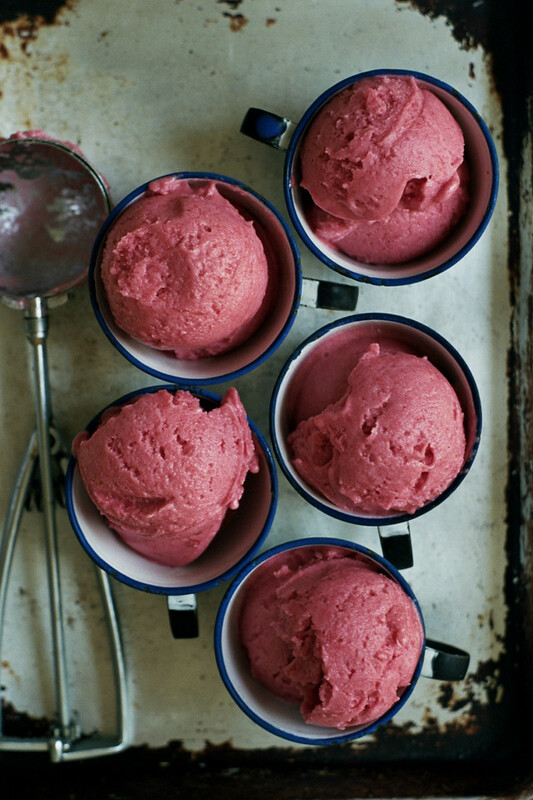 Just make sure to thaw the sorbet for a few minutes before scooping. 1. Combine the sugar and water in a medium sized saucepan and heat on medium high, stirring occasionally until the sugar dissolves. Add in the rhubarb and simmer until the rhubarb is very tender and beginning to fall apart, about 10 minutes. 2. Carefully transfer the mixture to a blender (or use an immersion blender) and blend until smooth. Add in the lime juice and corn syrup. Chill thoroughly. 3. Just before churning, stir in the gin. Freeze the chilled mixture in an ice cream machine, according to the manufacturer's instructions. Store in the freezer in an airtight container. Whip the cream to soft peaks then add in the sugar, followed by the rose water (one drop at a time) until desired flavor is reached. 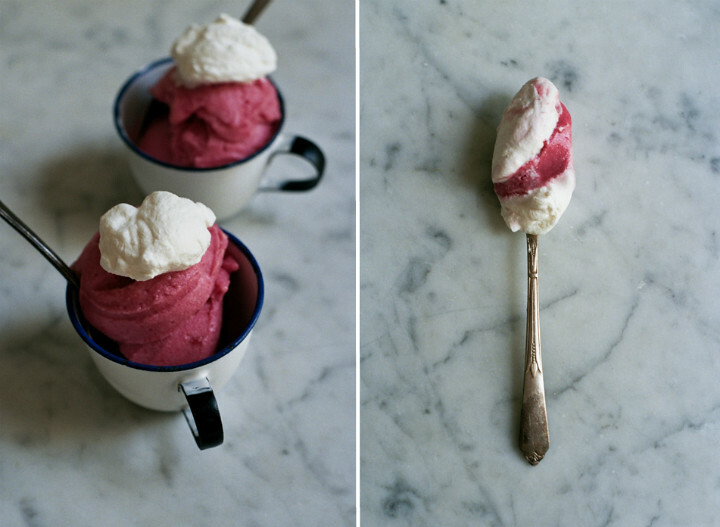 Top scoops of sorbet with a few drops of chilled gin and a spoonful of rose cream.